…It is significant that in planning this celebration we were ambivalent about whether to mark our tenth or our first year. The decision interestingly enough was to emphasize our first birthday. I do not think that this meant that we were unmindful of the meaning and importance of the years that preceded our independence, but perhaps rather that we were eager to look ahead — that our focus was on the future. One thing that comes across when looking at the life of Allyn Robinson is the fact that he was always trying to bring people together. And the further apart they were, the better he liked it. I recently had the opportunity to speak over the phone with Sarah Robinson Munson, Allyn Robinson’s daughter, herself a retired teacher and former Peace Corps member (and as an aside, Mrs. Munson was married at Dowling, in the foyer between the Hunt Room and the Ballroom). She noted that her father had a knack for bringing people together. He enjoyed a heated conversation as much as he loved his omnipresent pipe. While Minister of the United Church in Raleigh, North Carolina from 1939-1946, Dr. Robinson founded the Institute of Religion – a forum for bringing together diverse congregations to hear the likes of Eleanor Roosevelt and Norman Thomas speak. Attendees included many black congregations, which integrated not only the lectures but the accompanying sit down meals. This fact, according to Mrs. Munson, raised the ire of Raleigh resident Jesse Helms. Dr. Robinson was also a world traveler. In addition to trips to Soviet Russia and Israel, he visited Pakistan and India in 1957 where he met with Prime Minister Nehru. In the late 1950s he was involved in helping New York City police develop their community relations skills in the midst of a large influx of Puerto Rican immigrants. And of course as the President of a fledgling liberal arts college nestled in the middle of a residential community, he had his share of town/gown disputes to manage. Dr. Allyn Robinson retired from Dowling in 1977 at which time a tribute was held in his honor. To highlight some of the relationships he created, the following excerpts are taken from the tribute program. Being the first President of anything is a high-risk occupation; one might also be the last President, unless one has the talents and abilities of an Allyn Robinson – in which case the enterprise will be passed on to the second President as a strong, healthy, thriving institution. There is something about you which makes an association supportive and exciting. There is a way that you have which tends to encourage an individual to bring to crystallization ideas which are hazy and still to be shaped and honed. Your years at Dowling have confirmed Tacitus’ saying “reason and calm judgment are the qualities especially belonging to a leader. 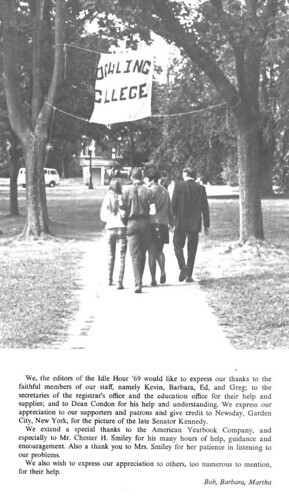 As our year-long project draws to a close, we’d like to echo the editors of the 1969 yearbook and add our thanks to all those who worked on the yearbooks of the 1960s and 70s from which we’ve drawn most of our images. Likewise to those students who gave their time and effort to the New Voice and other campus publications. Without your work, this project would not have been possible. Kami and I went in search of the Loft Theatre. To tell you the truth, it was an area of campus I had never ventured into – the vast space above the basketball court in the Curtin Student Center (aka the Carriage House and Astor Hall). We could have entitled this post “the more things change…” because what we found is probably pretty close to what students found in the late sixties: a large hidden area of campus filled with assorted bric a brac and a lot of potential. Of course, we’re only talking about the physical loft. The Loft Theatre moved on to the Performing Arts Center in the early 1970s when the old Vanderbilt power house was refurbished into a black box space. Theatre is alive at Dowling to this day in the form of the contemporary Loft Theatre headed by Prof. Andrew Karp. So for now, take a look at the video that Kami shot on our excursion. I added in a few explanatory excerpts from oral history interviews with Ned Bobkoff, Marianne Accardi Giardini, and George Worthmore. The color photos are courtesy of Ned Bobkoff and the rest were taken from Dowling College yearbooks. I’ve added the names of the shows being performed and their authors. According to Diane and her South Shore History wiki, the building you’re looking at was built in 1882; those beams overhead are therefore over one hundred and twenty years old. I don’t know the date of the small bit of graffiti you’ll see in the last shot but I like to think it was scribbled there in 1969 for us to find forty years later – a message from the past that makes a nice coda for our history of the Loft Theatre. 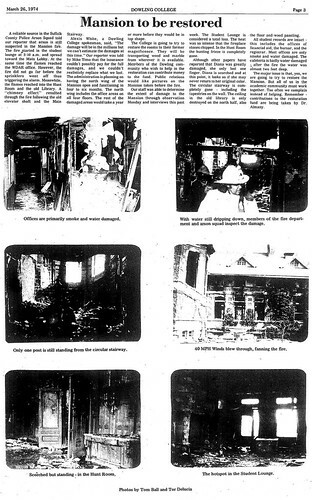 Mansion after the fire. Click photo to see more images. Our staff was able to determine the extent of damage to the Mansion through observation Monday and interviews this past week. The Student Lounge is considered a total loss. The heat was so intense that the fireplace stones chipped. In the Hunt Room the hunting frieze is completely gone. Although other papers have reported that Diana was greatly damaged, she only lost one finger. Diana is scorched and at this point, it looks as if she may never return to her original color. 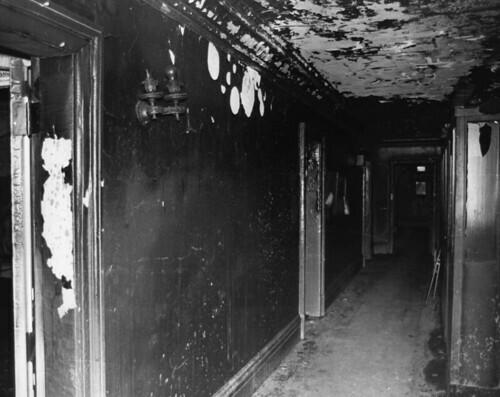 The circular stairway is completely gone – including the tapestries on the wall. The ceiling in the old library is only destroyed on the north half, also the floor and wood paneling. All student records are intact – this includes the offices of financial aid, the bursar, and the registrar. Most offices are only smoke and water damaged. The cafeteria is badly water damaged; after the fire the water was almost two feet deep.